There are many ways to measure the magnitude of a crash. Some might look at the overall points. This is not a valid statistic since the entire Crash of 1929 was a move from 386 to 40 on the Dow Jones Industrials. The more proper method of measuring the magnitude of any decline is in percentage terms. Looking at the overall percentage decline for the entire move gives one a clear sense of total magnitude. On this basis, the 1987 Crash was 40% compared to the Crash of 1929 of 89.6%. However, there is also a third way to look at the great crashes in history and that has to do with momentum and speed. We have looked at this issue several times in the past and we here provide a table illustrating how the Dow Jones Industrials faired following the immediate highs of 1929, 1937, 1946, 1966, 1973 and 1987. What is interesting, is that at the end of today’s session, the S&P 500 futures fell to 1060.00 on an intraday basis. The record high established precisely on July 20th in line with our Economic Confidence Model was 1199.40. Thus far within 12 trading days, the overall percentage decline between the high and low is 11.62%. Believe it or not, this is the WORST decline of this century when measured on a percentage basis for the first 12 days following a major high. As we can see from the above table, so far 1998 has dropped faster than any previous decline so far for this century. The previous declines of shocking magnitude in 1929 began on the second decline. The first major low following 1929 high took place on day 23. There was a brief 5-day reaction from the 320.5 to 358.8 level on the Dow or 11.95% gain from the 23 day low. However, things turned ugly shortly thereafter. The following 6 days saw the Dow make another new low on day 34. The next day, the Dow exceeded the previous day’s high but failed to close above it. Thus, day 35 was the last attempt to bottom-pick. The Crash of 1929 began on day 36 and continued lower each day, with the exception of a 2-day reaction until the first major low on day 51 – a decline of 49.39%. 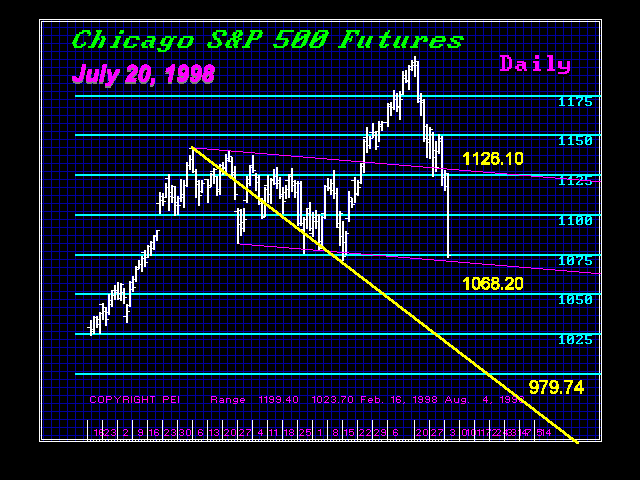 The 1987 decline saw two temporary-lows before the big crash unfolded. The first temp low came on day 10 followed by a 4-day reaction to the upside. The market fell once again to a new low on day 20. This was again followed by a more sustainable reaction, which lasted for 8 days. Again, we see a new low on day 34 followed by a 1 day reaction on day 35. This time, the 1-day reaction did manage to close just above the high of the previous day. Day 36 saw the start of the real meltdown and the final low came in on day 40 down 40.03%. What we find interesting is that in both cases of 1929 and 1987, the meltdown began on day 36. We also see important lows on day 40. In the case of 1929, there was a 2-day reaction followed by another round of selling into day 51. However, in 1987 day 40 was the final low. Even when we look at other markets such as the Nikkei, the decline for the first 11 trading days was only 5.44% and curious enough the meltdown began on the 34th trading day. The Nikkei continued lower falling 30.04% into the first major temporary low on the 64th trading day. In gold we also see a similar pattern from the 1980 high. The drop from $873 to $599 took place within the first 22 trading days and the meltdown to $453 began on the 34 trading day reaching its low on the 48th day of trading minus 48.1% before a sustainable reaction materialized. The interesting aspect of this limited comparison is how these patterns actually materialize relative to our models. Currently we see a Panic Cycle due the week after Labor Day going into the week of September 14th. Given the July 20th high, trading day 40 arrives on September 14th, 1998 precisely in line with our Panic Cycles. The 34th trading day turns out to be Friday, September 4th just before the long weekend for Labor Day. We have often seen normal markets reverse trend following Labor Day as vacations are over and new strategies emerge. Another important point to note is that the June low has now been penetrated in the Dow, S&P 500, and London FTSE. This key monthly support now warns that a correction is underway from a technical perspective. While that may sound obvious, it is not. Minor set-backs do NOT take out previous monthly support levels. The key markets to watch are the Continental Europeans. Once these markets also take out their June lows, we are most likely headed for a reasonable correction in the area of 23% for the US and more likely 40% for Europe. It is alo IMPORTANT to note that we have NOT elected a single Weekly Bearish Reversal since this bull market began on April 1st, 1994 (the start of the current 8.6-year business cycle on our Economic Confidence Model). We have 4 Weekly Bearish Reversals in the S&P 500 futures at 1100.50, 1099.00, 1071.00 and 1001.00. We have penetrated the first three intraday whereas the first Monthly Bearish resides also at 1001.00. A weekly closing above 1100.50 at the end of this week will signal a reaction to the upside. However, at the very least, we would need to see a weekly closing back ABOVE 1127.50 in order to see a solid consolidation phase begin. A close for this week BELOW 1099 will warn that reactions may be met with stiff resistance and a close for the week BELOW 1071.00 will warn that we should expect a test of the 1001 level by early September. Check the daily reports on these markets for specific targets and timing objectives. Fundamentally, earnings are clearly slowing from that of 1997. We suspect that they will NOT meet expectations during the second half of 1998. The Y2K problem will impact earnings as industry continues to try to cope with the 2000 deadline. However, European profits may fall even worse as companies prepare not merely for Y2K, but also with keeping two sets of books for the next 4 year transition period in the Euro. Combined these issues with continued problems in Japan, China and Russia, and it is hard to see where double digit growth can be expected going into the second half of 1998 or 1999.